I came across some interesting research from Oxford University that argues that everyone everywhere shares seven basic human traits. The research shows that across 60 cultures, we still have certain cornerstones of positive, collaborative behaviour that holds successful societies together. It’s an interesting point because there are so many ways in which modern society runs increasingly counter to those traditional, hierarchical structures. 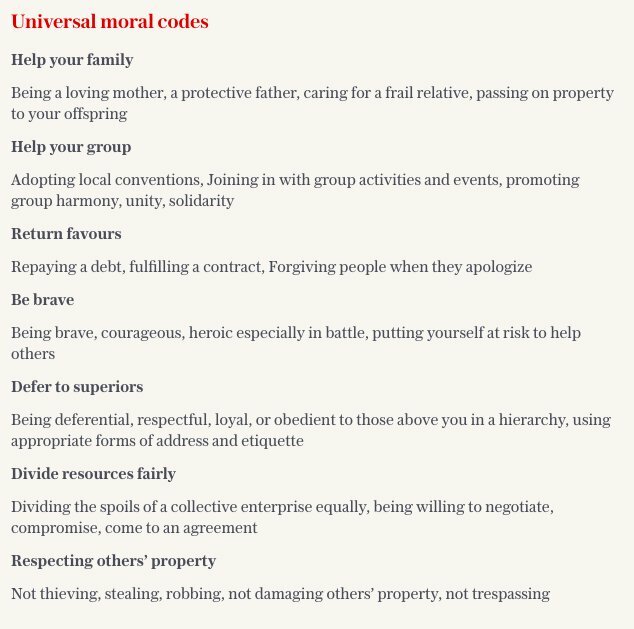 In short, the universal rules are: help your family, help your group, return favours, be brave, defer to superiors, divide resources fairly and respect the property of others. It seems to me that there’s a lot of resonance here with the sort of topics talked about by Dr Jordan Peterson. And whilst the world becomes increasingly secular and hierarchies get flattened, the need for structures in a society that used to rely predominantly on religions are becoming increasingly attractive to many. As ever, a lot of this is no more than simple common sense. But it seems that sometimes common sense just ain’t so common after all.